Pictured at ease, as dynamic, as visionary… until the first debate — Most of the 18 news outlets evaluated for the general election PrezPix study pictured Pres. Barack Obama less often but more positively than his opponent Mitt Romney. In September, early in the fall campaign, Obama appeared visionary, backed by the American flag, staring boldly ahead. On other occasions he could be seen exhorting the crowds, or wading among groups of students, women, veterans, workers, seniors, African-Americans, all with broad smiles and outstretched hands. Campaign excitement came through palpably in the photos. Then came the first debate on October 3. 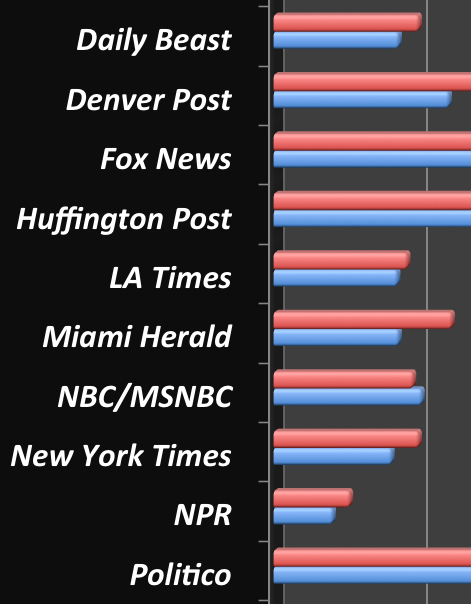 Images from the 90 minutes of the first debate dominated coverage of the next week (even more than the photos of the second debate dominated that week’s coverage. — The 18 news publications literally ran the same reflex blue-backgrounded photos of the first debate over and over again. Whether covering the first debate, or using the fallout from that debate to frame follow-up campaign events and stories, the visuals from the entire first week of October appeared to be photo stills from a political Groundhog Day. Photos of Obama went (somewhat) negative after the first debate — but regained some (positive) ground after the second “comeback” debate — The photos published from the first debate featured an appreciably different set of expressions on Obama’s face — often in split-screen images with Romney — than the photos had in the weeks before. Obama appeared less certain, more frustrated, less ebullient. Photos showed him smiling less, looking down more, grimacing, alone. And that shift in tone was repeated and repeated and repeated in a few similar images. Slowly, by the week of the second debate, the tone began to shift back, but while Obama started to smile again, far fewer pictures appeared showing the spontaneity and informality of his earlier interactions with supporters. Four years on, still an inspiring leader: In the photos published in mid-September 2012, the camera loved Barack Obama’s lean frame, narrow face and infectious grin. Two weeks before the first debate, news outlets selected photos where Obama’s body language mimicked what the polls were saying: he was confident and the crowds loved him. Although the 18 publications in this study published more photographs of Mitt Romney, those online news outlets published more positive photos of Obama. A dynamic presence: Whether photos pictured the president speaking from a podium or standing, walking or running on ground level, the camera often caught him leaning slightly forward to make his points and to connect to the public. When his audience appeared in the frame, the energy of the crowd and his apparent enthusiasm were almost palpable. A split-screen image of Obama and Romney taken from images in the first presidential debate on Oct. 3, 2012. This image appeared the day after the debate on Fox News, and then repeatedly afterwards, including after the second debate on Oct. 13. The dampening effect of the first debate came through in the photo selection made almost uniformly across news outlets: In photos before the first debate the president appeared dynamic and energetic — but that dissipated after his lackluster performance. Presidential and energetic… until he wasn’t: Photographs of Obama went from showing him as the confident man who still stood for “Hope” to depicting him as frustrated, defensive, weary. While the photos of Obama after the first debate rarely showed him angry or haughty or vulnerable, as several of the GOP candidates had appeared during the primaries, neither did the photos make him look as much like a leader as he had. The repetition of the same images for much of a week appeared concurrently with the dip in Obama’s public opinion polls. The same grim images appeared over and over — and the tone tracked his dipping poll numbers. Researchers noted that, at least in many of the split-screen images, Obama often came out looking worse than Romney. 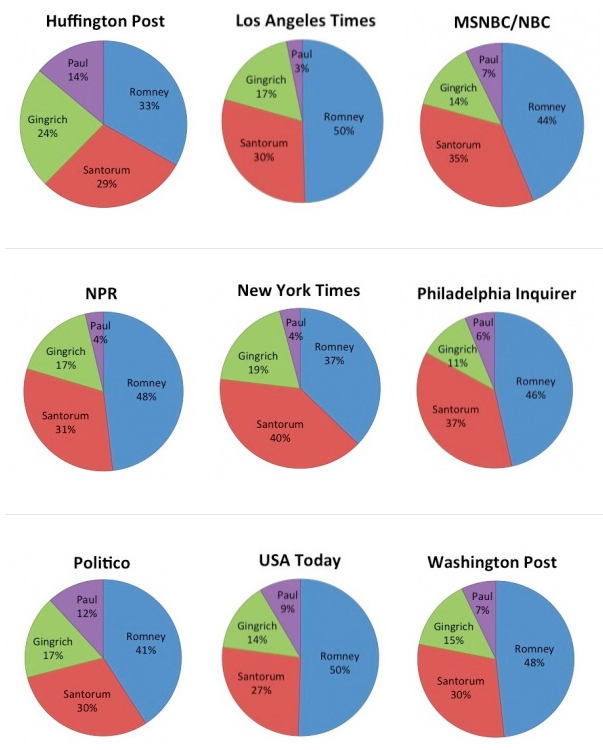 Campaign coverage became predictable, even in the midst of the up-down-up of the polls and the images that tracked public opinion: By the middle of October, the grinding nature of the campaign found parallel in the photos of it. In most news outlets, the two men’s “positive,” “neutral” and “negative” numbers were in rough parity — more so than ever before — but at a cost of the kinds of dynamic shots familiar to partisans of both men from earlier on in the campaign: the kinds of photos seen in the primaries of Romney, and the kinds of photos seen before the debates of Obama. In mid-October, Obama’s “positive” numbers remained higher than Romney’s, in large measure because he tended to have “better” grassroots shots — the relatively few campaign shots that appeared showed Obama laughing and smiling again, with crowds of supporters again, while Romney was still more often photographed alone and speaking from a podium rather than smiling in the midst of a group of voters. Debate shots and mirror-image photos dominated the coverage, with a sprinkling of photos of the candidates out shaking hands. 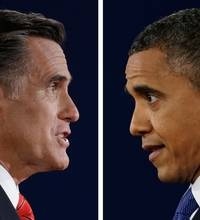 Researchers observed that the photographs of both Obama and Romney in the October campaign became formulaic. It wasn’t only that every article or blog post appeared to be illustrated with a photo from one of the debates, it was also that the pictures were all so recognizable — the pointing from the podium shot, the throw-the-head-back-and-laugh shot, the wave to the crowd with an American flag in the background shot. Not exactly boring — because all the photos emphasized the theater of the campaign — but so very predictable in their documentation of the contrived theater of the moment. For additional details about the photographic coverage of Barack Obama, see the individual news outlet pages.